NOTE: The Following Post Contains MAJOR SPOILERS for Suicide Squad. By now most people who intended to see Suicide Squad in the early days of release, when the conversation is most passionate, have likely taken in the story. And for all the fan service packed into it, from fan-favorite characters like Deadshot and Harley Quinn, to expanding the DCEU's magic, and government powerhouses, the film's final battle actually placed most of the glory on the shoulders of the least likely candidate: Chato Santana a.k.a. El Diablo (Jay Hernandez). We say least likely only because the villain has been a supporting character in the most recent eras of DC Comics, and the final fight pushed his powers of pyrokinesis to never-before-seen limits, quite literally transforming him from man to mystical warrior. There's a good chance audience members, and even DC Comics diehards were left confused at just what they had seen happen, and what it should mean for the DCEU as a whole. 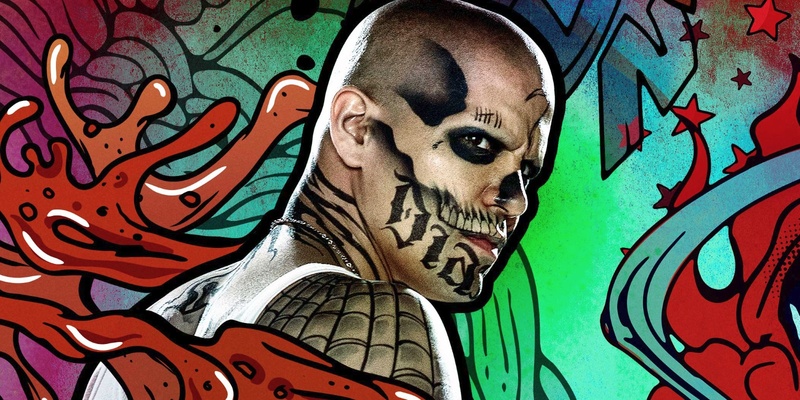 To answer that question, and truly appreciate how David Ayer and company condensed the entire history of El Diablo into one character, we're going to have to start at the star - for the sake of a complete explanation. First things first: doing research on your own is going to get complicated fast, since there have actually been three DC Comics characters bearing the moniker of 'El Diablo.' The first case was a story told in "All-Star Western" in 1970, following a hero not all that dissimilar from The Lone Ranger. The star of the story, Lazarus Lane has a close call with some vicious outlaws, before a bolt of lightning sends him into a coma. Falling under the care of a wise Native American shaman called 'Wise Owl,' Lane is nursed back to health... sort of. You see, he returns as his other half - wearing the black hat, cape, and domino mask of 'El Diablo,' carrying swift justice to outlaws and criminals with eyes glowing red as if pulled from Hell itself. The strangest wrinkle? The closing panel of his first story revealed El Diablo tearing up the countryside... but Lazarus still seated comatose in front of a crackling fire. So while his physical form sat motionless, his spirit was setting things right for the victimized and downtrodden of the American West. The story of Lazarus Lane was made a bit more complex in 2007, when in the pages of the "Jonah Hex" book, the disfigured cowboy comes across El Diablo himself, just as he had been depicted decades earlier. But this time, El Diablo has been separated from his host, Lazarus Lane, and trapped inside a brothel bedroom. To keep it simple: the issue revealed El Diablo to actually be a Spirit of Vengeance (not unlike DC's Spectre), latching onto Lazarus Lane's body, since it was strong enough to keep the spirit tied to Earth, and not returning to Hell. Also around this time, stories painted Wise Owl as less of a healer, and more of cunning trickster who linked the spirit to Lazarus' body against his will. So over the years, the role of El Diablo went from being a heroic alter ego, to a spirit of vengeance occupying that man's physical body, to a creature from Hell manipulated into Lane's body by Wise Owl, eventually vanishing and returning Lazarus Lane to the land of the living. But in between his first appearance in the Old West and this retcon, another version of El Diablo had been created for the changing DC Universe. Created in 1989, the new "El Diablo" comic series followed hero Rafael Sandoval, a Texas city councilman who decided to take on a vigilante persona to clean up the streets of his community. He chose the name of El Diablo (obviously), along with a costume so close to the original, it had to give comic fans at the time a serious case of deja vu. Now,this version of Diablo didn't possess any superpowers of his own, but a pivotal storyline crossing him over into the "Justice League" book changed all that. With Rafael sent adrift on a mystical plane, he was greeted by an Aztec god looking for a host through which to break into the realm of the living. The story pulled broadly from Aztec history and mythology, but didn't adapt any explicit element that we could explore in depth. The Aztec deity (or 'devil') simply possessed Sandoval, and pitted him against the entire Justice League before he could be stopped (and his series ended). That paved the way for the return of the original Lazarus Lane years later, followed soon after by the most recent version of the character. With the previous version of the character taking such a different approach to the mythology, it's no surprise that the next version returned to the roots of the series. The story began when an L.A. gangster wound up getting shot and paralyzed during a gun sale, and was taken to recover at a nearby hospital, sharing the room with a comatose, elderly man - who happened to be named Lazarus Lane. And at one hundred and seventy years old, even being comatose was an accomplishment. Chato spilled out his life story to the unconscious man, until his former gangland soldiers returned to kill him before he could be forced to testify against them. And as death came for Chato, he found himself recruited onto an astral plane to meet the real Lazarus, prepared to hand over the title, duties, and 'curse' of El Diablo to the young man. In the process of the recruitment and passing of the torch (carried out over the six issue series), Lazarus revealed to Chato the true nature of the spirit, as he had learned. When the deceased spirit of a rabbi sent El Diablo on a mission to find those responsible, killing the guilty party didn't send the rabbi's ghost away - instead, he referred to the spirit as "a son of Chutriel," a fallen angel who chose to remain in Hell as its righteous punisher of the guilty. As the truth began to trickle out, and more mythology became available to the characters tracking Chato and Lazarus down, the true nature of the curse became clear. The curse was twofold: it kept Chutriel (a name given to this spiritual figure in every world religion) locked out of Hell, keeping it from ending the world with a demonic coupling, but cursed the human bonded to it to walk the Earth, endlessly seeking out the guilty and doling out punishment. The story saw Lazarus Lane taken out by the servants of yet another demonic host (that coupling was a coveted act), and Chato Santana adopting the curse and title with acceptance. Possessing a Sumerian god of vengeance, as the entity was called by the end of the series was no joke. But it was a solid story, and expanded on the core mythology behind the masked cowboy who debuted in DC Comics so many years before. With the relaunch of DC's New 52, this most recent, tattooed, fire-wielding version of El Diablo was inducted into the first incarnation of the Suicide Squad, alongside past and future mainstays Deadshot and Harley Quinn. Instead of a fiery whip and demonic horse, this version of Chato Santana was a pyromancer with few limitations. And as much as the cover art depicted him as an out of control pyromaniac, the real Chato Santana was just as repentant and humble as his previous, cursed version. When using his metahuman gift of fire to wreak havoc on a rival gang, Chato learned too late that the house he had consumed with flame was also home to women and children who had little to do with the actual conflict. Having crossed the line in anger, Chato surrendered to the police, and refused to do evil ever again. As his time with the Squad continued on through multiple issues, his faith, unwavering humility and questioning of senseless killing - not to mention his overriding guilt - defined a new take on the character. And even if David Ayer came to fold elements of each of these stories into his version for Suicide Squad, his villain walks in the shoes and storyline of the New 52 Chato.s to the next room, rescues her brother, leaving him to regain his power as he returns to await deployment back to him. When she returns with Rick Flag and the bomb she's supposed to use to blow up the 'non-human entity,' none of them are aware that the entity is her brother - or that she's about to try to kill them. Those who've seen the film already know that the origin story offered by Santana (Hernandez) is a close version of the above scene. But instead of killing innocent women and children by letting his anger and lust for revenge cloud his mind, the movie's version actually has Chato kill his own wife and children in a fit of rage. It serves the same purpose, but it's not the most important change/explicit clarification made for the movie. That honor goes to the fact that the powers and burden of 'El Diablo' are no longer a curse encountered, but one that has followed Chato his entire life. He admits as much in the film, revealing that this curse from Hell itself has been with him all his life, but he has resisted using it for most of his years. Unfortunately, his claim that using the fire to gain power created an escalating cycle is completely devoid of the guilt/vengeance/spiritual duties aspect of the first Chato. But the true combination of this long and winding history comes to a head when El Diablo decides that he has no choice but to fully embrace this curse, using all the power within him to help kill the villainous Incubus - brother to Enchantress. And in this case, "embracing the curse" means transforming into a giant, burning skeleton decked out in Central American headdress and decoration. The imagery isn't a far cry from that seen in the pages of "Suicide Squad," but the comics never showed Chato actually becoming a demonic spirit in physical form. Given the backstory and mythology, it would seem that the skeletal figure seen in the movie's final fight is the true appearance of the curse/spirit occupying Chato's body. And if that's the case, then it's weaving together the 'curse' of Lazarus Lane, the Aztec/Mayan/Central American deity possession of Rafael Sandoval, and the appearance and backstory of Chato Santana. In the process, it also confirms that while Enchantress and her brother may be ancient deities, they certainly aren't the only ones kicking around the Earth. It's possible that in the DCEU (as in the comic book universe) deities of most, if not all world religions coexist on a plane beyond our own, shown to be monitoring if not outright controlling the magical forces behind characters like Shazam, John Constantine, Phantom Stranger... the list goes on and on. So even though audiences were promised a story of the "worst heroes ever," what they got was an ancient Incubus pulled right out of the original "Suicide Squad" run, doing battle with the impressive, physical form of the spirit of vengeance that's been cursing the DC characters known as 'El Diablo' since the 1970s. The real questions start once you explore the magical forces that were fueling them both - and, as Enchantress revealed, the magic is rising in the DC movie universe... so who knows where and how it will rear its head next? Suicide Squad is now playing in theaters. Wonder Woman arrives on June 2, 2017; Justice League on November 17, 2017; Aquaman on July 27, 2018; an untitled DC Film on October 5, 2018; Shazam on April 5, 2019; Justice League 2 on June 14, 2019; an untitled DC film on November 1, 2019; Cyborg on April 3, 2020; and Green Lantern Corps on July 24, 2020. The Flash and Batman solo movie are currently without release dates.